Whether you’re a professional sushi chef or you just want to cut and assemble sushi from the comfort of your own home a good sashimi knife is an essential tool for you. Known by the Japanese as a “yanagi” or “yanagiba”, this traditional sushi/sashimi knife has a long, thin, very sharp blade perfect for slicing uncooked fish. While you don’t necessarily need the best sushi knife to make an amazing tasting dinner, it will help tremendously with presentation. Unfortunately, good sushi knives are not cheap. But they are a tool that if purchased correctly should last you a lifetime. Since you’re here, odds are that you already know this, but we do get the question from time to time, so let’s cover it. Sushi and sashimi are terms that are often used interchangeably. There is very little difference, but technically they are not the same thing. Sashimi is thinly sliced raw meat, usually tuna or salmon, whereas sushi is rice mixed along with other ingredients. These may or may not include some of the same raw meats that make up sashimi. The knives for both of these traditional Japanese foods are basically the same and we will use the terms as such below. Traditional yanagiba sushi knives have a one-sided edge, so keep an eye out if you’re left-handed since you’ll need a sushi knife made in the correct orientation. They slice differently than some knives as you’ll slice with a motion pulling the knife towards you. 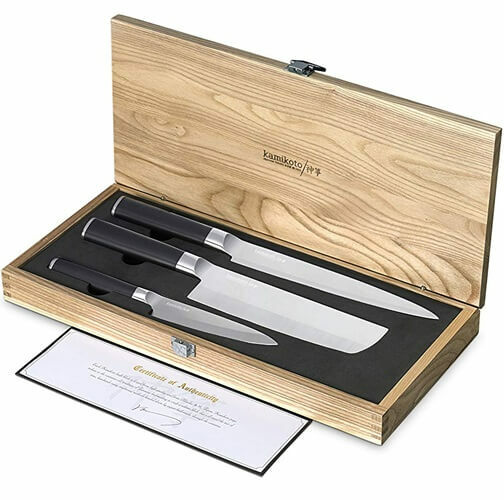 In order to get these knives ultra-sharp so they provide a perfect presentation each and every slice, knife makers use high-quality, hardened steel. This also helps them retain this sharp edge for a longer period of time. Speaking of high quality, here are our sushi knife reviews where we recommend some of the best options available. The Cangshan J Series sashimi knife is a 12″ long work of art. It has 67 layers to create a beautiful damascus pattern that is capped of with an awesome walnut/magnetic sheath. This knife has the materials and craftsmanship to back up the wonderful social proof that shows in ratings and reviews this sashimi knife receives on the internet. It really is razor-sharp, functional, and beautiful! This Yoshihiro VGYA270SH yanagi knife is a wonderful compromise of quality and being reasonably priced. This is no cheap, mass-produced sushi knife. Each VGYA270SH is individually hand-crafted by artisans in Japan. The Rockwell Hardness 62-63 VG steel provides great edge retention and sharpness whether you’re a beginner or a professional sushi chef. This knife comes in 9.5″, 10.5″, and 11.8″. Follow this link to see all 3 on sushi knives on Amazon. Note: The video above shows a D-shaped handle. The review and links are for the Octogonal-shaped handle version. Dalstrong’s Phantom series is an opportunity to get superior quality knives at an affordable price. This yanagiba is on the low-end of sushi knives and we’ve rated it the best sushi knife under $100! The scalpel-sharp edge has a mirror polish and a single-sided bevel at 13-15 degrees. Like most other Dalstrong knives, this yanagiba comes with a locking sheath and their 100% money-back stamp of approval. This Yoshihiro Suminagashi Yanagi is a true professional chef’s sashimi knife. The blue steel #1 is very hard and has a beautiful Sumiganashi (wavy) pattern on it, but it will oxidize if the proper care is not taken. The hardness of the material on this knife also means it will hold a razor sharp edge and retain it longer than standard knives will. The knife is paired with a traditional Japanese bolster and handle set made of water buffalo horn and ebony tree respectively. This Yanagi is made specifically for slicing thin cuts of fish for sushi and sashimi. It also comes with Tsubaki oil for storing the knife. This Yanagi comes in lengths of 9.5″, 10.5″, 11.8″, and 13″. This is really the best sushi knife on the list, but its price-point shuts out most of our readers, so it made its way down to #4. Clearly by now, you see that Yoshihiro makes amazing sushi knives! Yes, another awesome professional sushi chef knife made of blue steel #1. This one is a Yanagi Kiritsuke, which is slightly heavier due to the wider blade and thicker spine. The tip shape helps with weight balance and makes this knife unique to others on our list. Again, this is 100% hand-made in Japan specifically for sashimi and/or sushi chefs. Did you see the beautiful dragon engraved on the side of the knife blade? This one comes in 10.5″ and 11.8″ lengths. Click the link above to see more options. The Yoshihiro is a true Japanese sushi knife with its hammered Damascus pattern and VG-10 blade material. With its ultra-sharp blade and 60 HRC, this yanagiba sushi knife gives up nothing when it comes to quality or functionality. If you like the mahogany handle or hammered Damascus look, this is a good sushi knife for you. We love value the consumer gets in this high quality Japanese sushi knife. For the materials used and the performance of this knife, you will pay much less than you would in other brands. It’s also very nice with the double bevel that it’s both a right hand and left-handed sushi knife. The only downside is that we could not find any warranty information on this particular knife. This is a perfect sushi/sashimi knife for a novice. It’s stain-resistant stainless steel rather than high-carbon steel. Yes, you give up some hardness in that trade-off, but don’t need to worry about rust. This Global sashimi knife also has the double-sided blade if that’s what you are accustomed to. There is no right hand or left-handed concerns and it makes sharpening more intuitive. It has great balance and weight for cutting both sushi and sashimi. It’s only fitting that one Japan’s most famous knife makers gets on the list of the best sushi knives. Made in Seki City, Japan (home of the samurai sword makers), this yanagiba uses 71 alternating layers of VG10 and VG2 steels to create a full forged Damascus. Since these 2 steels wear at different rates, they create micro serrations on the edge so that it stays sharper longer. This is a high-end Shun sushi knife for a big collector or professional chef in all likelihood. This is a set of 3 knives at a reasonable price for a home cook that wants to try their skills at sushi or sashimi. Please take note that these knives are not made of the same quality materials and/or craftsmanship as the rest on the list. Although these say they use Japanese steel, it appears they are actually made in China. This is a decent sushi knife set that includes a few different knives. If you were looking for something high-end, look at sushi knives for sale on this list. Before we start, let’s discuss a commonly asked question. Do I really need a sushi knife to make sushi or sashimi at home? Clearly the answer is no. You also don’t need a steak knife to make steaks at home, duh! It of course won’t make the food task any better either. But, it sure does make preparation more convenient. Additionally, presentation is half the fun with sushi and sashimi and a good, sharp Japanese sushi knife will make the difference there. While purchasing a sushi knife set is a good way to get into the hobby at a good price per knife as you saw in our #10 of our list above. However most of the best sushi knives are not going to come in a set, and these are typically of much lower quality than those that you would purchase separately. As a general rule, we would advise against buying a sushi knife set and rather find some cheap sushi knife at Amazon or to save up until you can afford a good knife like those listed above. So you’ve seen our list of the top sushi/sashimi knives available and even read about each of their features and why we like them, but what if you’re still not sure? What if you found a different sushi knife you like and you’re not sure if it’s a good one? The BladeAdvisor is here to help. We don’t expect you to follow our recommendations like a bunch of blind sheep. You came here for some insight and if you’re still reading, you want more of an education. So that’s just what we’re going to give you. The topics below are criteria we followed in order to select the knives in our list above. You can use the same guidelines to compare/contrast with your own findings. What do you think, are you ready? One of the single most important factors in a good sushi knife is that it is extremely sharp and stays that way for as long as possible. In order for this to happen, you’re looking for a very hard steel alloy, or one with a high carbon content. This allows the artisans to put a sharp edge from the factory and will also assist with edge retention. In high-end sushi knives, you can expect to see blue steel #1 and white steel show up as a couple of the top options. VG-10 is also pretty good and will save you a few bucks. Handle materials are less important than the steel blade, but should still be part of your consideration. Typically the material used is what give the handle its look and feel. If you’re going to spend big bucks on a nice sushi chef knife, you should definitely like the way it looks. Typical Yanagibas, or sushi knives, come in lengths from around 7″ up to 13″, or more. The proper motion for slicing through sashimi is a single, uninterrupted pulling cut through the meat, leaving a nice clean edge throughout. The longer your knife, the easier it is to do this on all pieces of meat. A shorter knife would not allow this and would require the user to make multiple strokes, not leaving a clean edge. The trade-off to a long knife blade is that they require more steel to manufacture. And in a good knife, these alloys are expensive materials, thus increasing the cost of the knife substantially when you go up to the next side in blade length. One quick look at our list above, you should be able to tell, that brands matter in sushi knives. Our Yoshihiro reviews clearly show that they make great sushi knives. In fact, we left several really nice ones off the list in order to offer a wider variety of knife reviews for our readers. They are truly the best sushi knife brand with a number to great options to choose from. You can compare this list to our best steak knife list and you’ll see that few brands are the same on both lists. Most of them are quite different in fact. The reason is that when you’re a world-class knife maker, you typically have a one or two specialties that you’re really good at. The point here is that you want to stick with a brand that is good at making sushi knives and also one that will stand behind their product. The top sushi knife makers will use the best steel alloys and make their yanagiba sushi knives by hand following traditional methods. Does it really matter if a sushi knife is made in Japan? Well no, not if a Japanese Yanagiba artisan is in Germany making knives and Cousin Frank is visiting Japan trying his luck at forging a knife for the first time. The reason the Japanese are considered the best sushi knife makers should be obvious. That’s where sushi comes from. Long, thin, sharp knives have traditionally been made in Japan for centuries. In fact, it’s quite popular to buy knives that are specifically make in Seki City, Japan, which is home to many sword makers as well. Maybe it’s not fair to make a blanket statement that all Japanese sushi knives are better than any non-Japanese knife. However, generally speaking they are unmatched in this arena. Japanese sushi chefs take pride in the tools of their trade. Besides, as we mentioned above, much of preparing sushi is about the presentation. In some restaurants it’s even about the entertainment of it all. For this reason, some of the higher-end yanagiba sushi knives have Damascus (layering of multiple steel alloys), Herringbone, or Suminagashi patterns in them. In other knives, you’ll find intricate etchings of symbols or even dragons as we saw on one of the knives on our list above. This picture shows a couple of examples of patterns you might see on a sushi knife. With the origins of both in the Japanese culture, you see similar patterns in some of the best santoku knives also. As is always important, your budget will likely dictate how good of a sushi chef knife you decide to purchase. The good news is, everyone can find a yanagiba sushi knife in their price range. That’s because you can find poorly made, cheap sushi knives starting around $20. These are junk compared to anything else written about on this page, and they won’t last. On the exact opposite end of the spectrum, the most expensive yanagiba will be well into the thousands of dollars. These are mostly specialty knives made as a professional sushi chef knife, or even for collectors of high-end Japanese knives and swords. If you’re looking for a decently built knife at a good price, there are a few good options on the list above. When you’ve checked all the boxes and have narrowed it down to a couple knives, or even think you’ve found the one, it’s time to go to the reviews. Both online reviews pages like the one you’re reading now or the feedback and ratings that customers who have previously purchased the knife leave are great sources of information and education. Not sure you’re ready to plop down $200-$300 on a Japanese sushi knife without seeing it and holding it in person first? Check out the reviews left by previous buyers. Are they happy with their purchase? Did something disappoint them? Do you have questions for us? Resources online are endless these days. Take advantage of them! Do You Need a Left Handed Sushi Knife? As we briefly mentioned a couple times above, a sushi chef knife with a single bevel is made for a specific hand orientation. Most often they default to being a right-handed knife since most of us are in fact right-handed. If that’s not you, you’ll need to find a left-handed yanagiba. As long as you know to look for one, a left-handed sushi knife is not that hard to find. However, they are much less common. Unfortunately, they can be special order one some of the very high-end knives since they are not mass-produced by factories. Of course, double edged knives are ambidextrous and accommodate everyone. If you’re a lefty and need some additional help, we’ve done the research and found a couple good left-handed yanagibas for you. This Yoshihiro is one of the best left handed yanagiba sushi knife available for sale at Amazon. Note, due to its high-carbon steel and the fact that it can oxidize if not properly cared for, it’s recommended for professional sushi chefs. This sashimi knife uses White Steel #2 and has an HRC of 62-63. It comes in 9.5″, 10.5″, and 11.8″ lengths and is hand-crafted in Japan. The Global G-11L left handed sushi knife is made from a single piece of CROMOVA 18 stainless steel. Of course it is a single edged blade and has great balance due to the hollow, sand-filled handle. This is yet another unique looking knife with a slip resistant handle from our friends over at Global. Unfortunately, this sushi knife only comes in 10-inch length. You might have noticed above that some of the knives in the list mentioned they were Sujihiki knives. So what’s the difference in Yanagiba vs Sujihiki knives? Again, like many other things in this industry, those of us outside of Japan have mixed and mingled the terms quite a bit and use them interchangeably. Technically, a Yanagiba knife is a single bevel knife made specifically for cutting sushi and sashimi. That means the blade is only sharpened on one side. The right hand for a right handed sushi chef and the left hand for a left handed sushi chef. The opposite side of the blade is either flat, or in most cases, actually slightly concave. By contrast, Sujihiki knives have a double edged blade and are more like other Western knives. So the blade is sharpened on both sides and can be much more comfortable to use by someone that’s not used to the single edged blades. Sujihiki knives are often more robust, thicker, and heavier blades than Yanagiba knives. The Yanagiba blade is very thin and light weight and often made of high carbon steel. Yanagiba knives require more practice and skill to use in the kitchen, but also need more attention in taking proper care of the blade from oxidation. Do you need both? Probably not. If you don’t venture into preparing Japanese food on a regular basis or as your profession, a double edged Sujihiki is probably something you’ll be more comfortable with and will require less practice. I hope we don’t sound like a broken record at this point, but sushi and sashimi is all about the presentation. In an effort to present the fish in the most beautiful way, there are many brilliant techniques for slicing and presenting each cut. There are cross-grain cuts and other cuts along the grain. Sometimes the tuna or salmon is presented alone, and other times with vegetables and/or rice. Here’s a video with Master Sushi Chef Hiroyuki Terada. Watch how he shows the proper way to cut and present sushi and sashimi in many different ways. By now you’ve seen our top 10 recommendations for the best sushi knife, read through our reviews, and educated yourself with our sushi knife buying guide. We believe we’ve armed you with the tools you need to make your own picks, whether it’s the most expensive sushi knife or just a cheap one. Of course your choice will depend on both your budget and the priorities you set on such a tool. The key is to follow the criteria above and make sure you don’t overpay for something that isn’t up to par in materials or workmanship. Please let us know if you have any questions or can think of anything we missed. We enjoy hearing from our readers on a regular basis.